P.J.M. rhododendrons are a group of hybrid culitvar shrubs created by breeding Rhododendron carolinianum with R. dauricum var. sempervirens. According to the University of Connecticut, there are at least seven known culitvars of varying size, spread flower and leaf coloration, but all are considered to be hardy and easy to grow evergreens in the garden. They have a tidy mounding growth habit, blooming in early spring and summer each year and require only light pruning once each year or every few years. 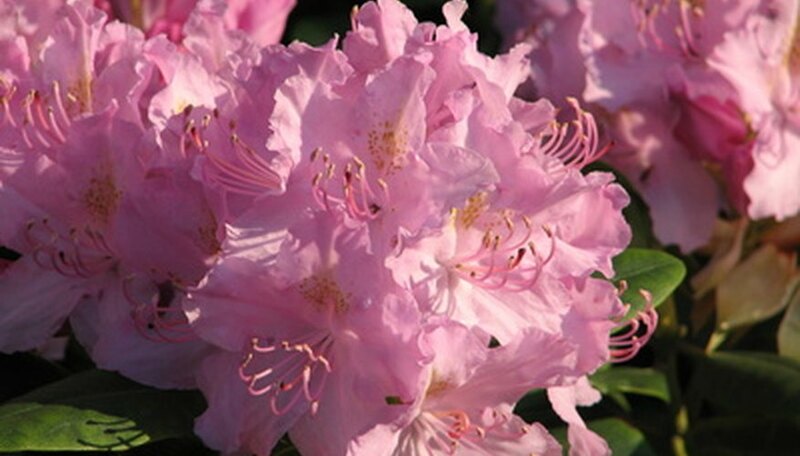 Prune your rhododendron in the summer immediately after the bloom cycle has ended. Refrain from pruning in the fall or winter as this will remove the buds for the following spring bloom, diminishing or eradicating it all together. Dead head spent flowers on your rhododendron as they die back to encourage fresh bloom and keep the shrub looking fresh and tidy. Pluck the flower heads off with your fingers or trim them off with pruning shears to just 1/4 inch above a leaf node or pair of leaves. Thin dead, diseased, defoliated or non-flowering branches by cutting the branch on the bias just outside where the problem branch connects to the healthy parent branch or limb. Reduce the size or spread of the shrub only if necessary by thinning out the longest and oldest branches down to where the meet the parent branch or main trunk. Refrain from shearing off just the tips of the branches, as this destroys the natural form of the plant and inhibits flowering. Never remove more than one-third of the rhododendron's living tissue mass in any pruning as this can cause stress on the shrub and induce shock.